Learn how to view a list of all your subscribed contacts or all of your unsubscribed contacts. 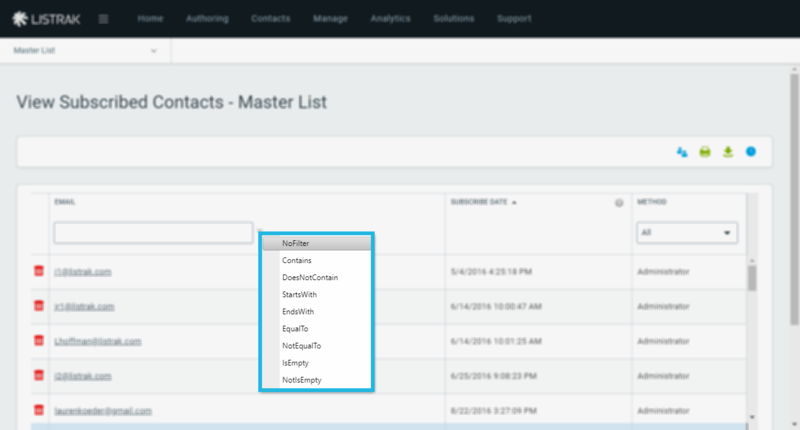 Select the list for which you'd like to view contacts from the left-hand list pane. NOTE: You can only view subscribed contacts for one list at a time using this feature. Then Subscribed Contacts (or Unsubscribed Contacts). 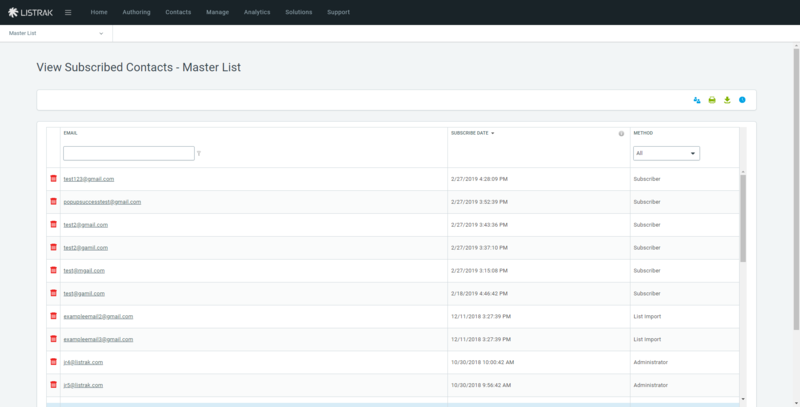 For this example, we chose Subscribed Contacts, so below is a list of contacts currently subscribed to the StyleCo Master list. The list displays the contacts' email addresses, along with the individual subscribe dates and subscribe methods. admin@styleco.com Click the individual's email address to view a contact details popup window that shows various system field captures along with segmentation data assigned to the contact. Click the graph icon to the right of any of the contacts to take a closer look at that particular contact's message history and details. 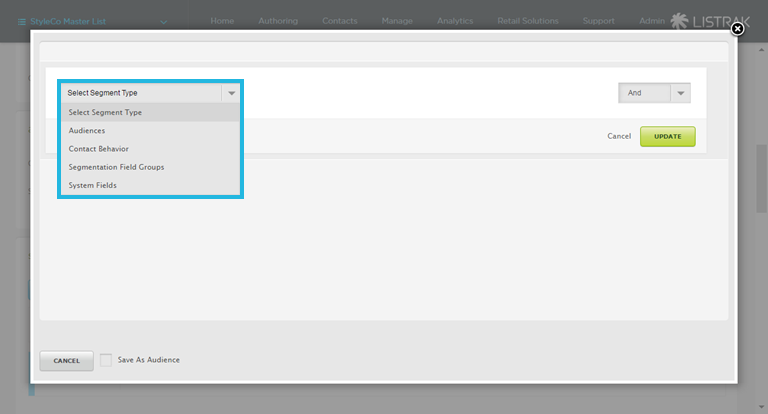 Click the Create Audiences icon. Use the list of contacts to create new segments. Typically, a filter is applied to the list of contacts before the segment is created, though it's not required. Print the data using the Print icon. Schedule an export using the Schedule Export icon. You can filter your results in several ways. Below is an explanation of the available filters. Subscribe Date: Sort based on when the contacts subscribed. Administrator: The contact was subscribed individually using Contacts > Subscribe/Unsubscribe Contacts. This method also includes anyone subscribing via an API method such as SubscribeContact or SetContact. List Import: The contact was subscribed as part of a list import. This method also includes anyone subscribing via an API method such as BulkLoadContacts. Subscriber: The contact clicked the subscribe link within the message, or filled out and submitted a subscribe form. Address Repair: The Listrak system administrator repaired the email address. List Hygiene: The contact was subscribed through a correction by list hygiene. Suppression: The contact was added to an existing suppression list that is attached to the current list. Administrative Address Change: The contact's address was changed individually using Contacts > Change a Contact's Address. Subscriber Address Change: The contact changed their address by using a change address form. Bounces: The contact reached the hard bounce count equal to the list setting "Remove users after X bounces." Subscriber: The contact clicked the unsubscribe link within the message or filled out and submitted an unsubscribe form. List Hygiene: The contact was removed because their original address was invalid and was replaced with a valid address. Abuse Complaint: The contact clicked "Report as Spam" or "Report as Abuse." Suppression: The contact was added to an existing suppression list that is associated with the current list. List Import: The contact was unsubscribed via Contacts > List Import > Remove Subscribers checkbox. 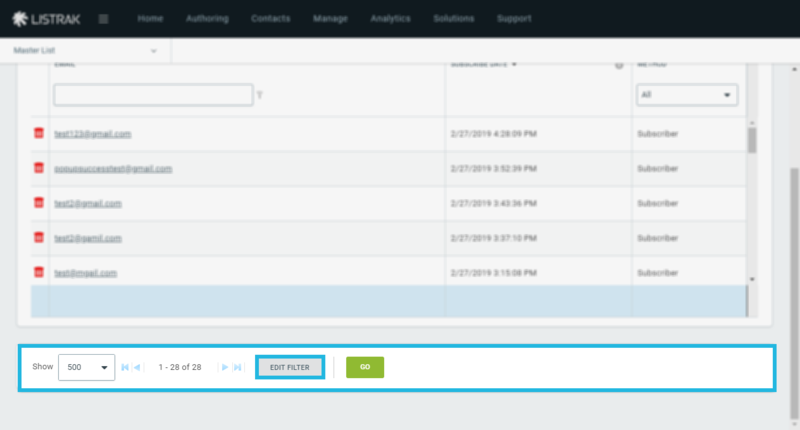 Aggregate Bounces: The contact's total hard bounce count equals X based on the list setting option, "Remove users after X bounces" in a list other than the current list. The contact was removed from this list due to the administrator opting "Yes" for the option in account settings, "When unsubscribing users due to bounces, should users be removed from all lists?" Aggregate Complaints: The contact clicked "Report as Spam" or "Report as Abuse" button while in another list and was removed from current list due to the setting under Account Settings labeled, "Do you want to remove abuse complaints from all of your lists?" being marked as "Yes". List-Unsubscribe: The contact clicked the Microsoft link "You're subscribed to this mailing list. Unsubscribe," which is automatically inserted via the list settings option to "Automatically Insert List-Unsubscribe Header." Administrative Address Change: The contact's email address was changed by the administrator using Contacts > Change a Contact's Address. Subscriber Address Change: The contact changed their own email address by clicking the optional change address link that can be added to messages via Support > Code Support > Email Change Address Link. Audience: Filter the list by audiences by clicking Edit Filter at the bottom of the screen. From there you can create a filter and click Update then Save to apply it.